1. Are you tired of fumbling for keys or cards in your bag? Are you scared of scratching your new smart phone? Have you sighed over leaked liquid from tumbled bottles? This bag organiser is the final solution to such problems. With the spacious compartment and 11 detached pockets, it keeps all your accessories in a tidy, organized manner, saving you much trouble and time. 2. Constructed of sturdy yet lightweight polyester felt, the bag organiser feels soft and smooth and is easy to carry about. It can stand on its own and hold many items without collapsing. 3. Two sizes for your choice, S:11.02×6.69×6.30", L:13.78×7.09×7.09". Please select a size 1-2 inches smaller than your tote bag so they can fit. 4. Function as organizer for handbag, purse, diaper bag, pocketbook, etc. Carry all your stuff neatly & orderly (wallet, glasses, pens, makeup case, iPad, notebook, file folder). Perfect organisation solution for Travel, Home, Office, Outdoor, Bathroom, Toilets, Hospital, etc. 5. This Bag Organiser will protect all your items from scratches, smudges and accidental damage caused by poor organisation. It will also save you valuable time as well as the stress of always looking around for your valuables and other accessories. Service === Your contacting is welcomed, please do contact us when needed and before leaving negative feedback, we'll reply with 24 hours and try our best to solve your problem. 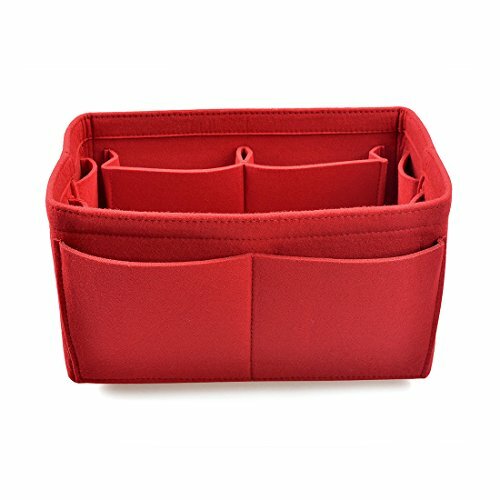 MULTIPURPOSE: these felt bag organisers can be used as cosmetic case, stationery holder, toy box, nappy storage bin, and container for miscellaneous items, perfect for office, home and car organization, travelling, etc. If you have any questions about this product by FREAHAP R, contact us by completing and submitting the form below. If you are looking for a specif part number, please include it with your message.